Some books are worth reading a second time. I was recently inspired to pull this book off my office bookshelf, dust it off, and read it again. This book contains a great deal of wisdom for managing a manufacturing operation. I’m quite happy I took the time to revisit this book, and refreshed my competency in Lean Manufacturing Principles. Bill introduces the key principles of Lean Manufacturing. One of the most important principles is Customer Value. Regardless of the activity, whether a manufacturing step, logistics, inventory, administrative step, etc., the key concept of customer value is whether the activity adds value for the customer. “Does this activity directly contribute to my customer’s product’s becoming more complete, and is the customer paying for this activity to occur?” If either question generates a NO answer, why are you doing it? The next concept is the Value Stream, which is defined as “the total cycle of activity, from initial customer contact through receiving payment for a product that has been delivered.” Careful evaluation of the value stream allows the manager to identify and prioritize opportunities for genuine cost reduction without compromising product quality, reliability, or other desirable product attributes. The principles of “flow” and “pull” denote the behavior of activity in the workplace. Flow implies “a seamless sequence of activity throughout the process, with no stalls, no disruptions, and no disconnects or backtrack loops.” The principle of pull is activities “are done when they are required to be done, not before.” Lean Manufacturing activities are therefore consumption – driven or customer demand – driven, as compared with a forecast – driven system. The essential principle of Lean Manufacturing is the continuous and ongoing elimination of waste. However, Lean Manufacturing redefines waste to include any wasteful activity. The goal is to eliminate any wasteful activity to ensure that all time and resources are devoted to additional value – added activity. Bill has organized “Lean Manufacturing That Works” into two sections. The first part is titled “The What” and it carefully and thoroughly explains the ideas and logic of Lean Manufacturing to best define “what we are trying to accomplish.” The second part is titled “The How” and it defines and describes the tools, techniques, and best practices to most effectively implement and maintain a Lean Manufacturing process. 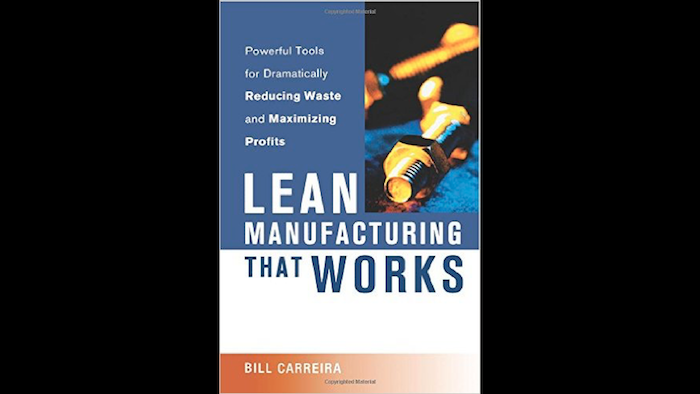 Bill has packed this 288 page book with dozens of charts, graphs, pictures, flowcharts, sample analyses, and real world examples to bring the Lean Manufacturing principles to life. Naturally, the contents of this book are most relevant to industrial manufacturing companies. However, any manager or business person can greatly benefit from the Lean Manufacturing philosophy, whether you are assembling cars, bicycles, providing warehouse or logistics services, running an accounting office, or providing medical services. I highly recommend this book to any serious business manager.